 New from H&Co, Inkwell is a tiny universe of fonts in which handwriting meets formal typography. Sixteen years ago this week, I was designing my wedding invitations. The invitations were set in my typefaces, and printed by a friend who runs a letterpress shop in Berkeley, and the enclosing envelopes were hand-addressed by a calligrapher. Each kind of letterform served a different purpose: the type was dignified, and the calligraphy was personal. But I never really figured out what to do with the map. Out-of-town guests would need a sophisticated map of the venue, explaining how to get there by road, rail, and air, where they might park, and some sort of assurance that it really was safe to take the subway. Set in type, this looked too institutional: it didn’t feel like it came from the bride and groom, but rather from someone’s marketing communications department. But rendered in calligraphy, it looked ridiculous. I felt like I was directing my friends and relatives to a wedding in Middle Earth. My dream was to letter this myself. Not in fussy, mannered calligraphy, but in simple block printing, something that was an extension of my own handwriting. I’d have done this, had I the time, skill, and patience. Instead, I filed away an idea for later, that somewhere there might be a useful intersection of type, calligraphy, and handwriting, that might one day become a typeface. Something with the versatility of type, not only because it could be summoned from the keyboard, but because it would have methodical drawings and spacing, a proper character set, and the kinds of relationships that designers depend on — italics, small caps, and so on. But it would also have the expressive dimension of handwriting, with writing’s ability to fluidly change styles to suit the message. (When something is important, I find myself dropping my longhand script in favor of letterspaced capitals, but still punctuating these with the occasional cursive “of” or “for.”) I imagined that a sufficiently large family of types could do the same thing, so I set to work on a prototype as a proof-of-concept for the idea. After simmering for more than a decade, we picked up the project last year, with H&Co typeface designer Jordan Bell leading the charge, and our Andy Clymer graciously lending an indispensable assist. Today we’re very pleased to introduce the result: Inkwell®, a collection of typefaces for expressive writing. Not quite a typeface, or even a family of typefaces, Inkwell is more like a family of families, featuring a Serif, a Sans, a Script, a Blackletter, a Tuscan, and a set of Open capitals. While it’s designed for serious content — it can effortlessly dispatch detailed maps, complex reference books, or anything displayed in a digital app — Inkwell wears its attitude lightly. It’s “serious” in the sense of thorough, rather than earnest, speaking in a decidedly personal, authorial voice.  Inkwell explores six different genres of type with which readers already have strong associations. It begins with Inkwell Serif, a book face for text, designed to avoid any obvious typographic style and simply look like “plainly lettered text.” It’s provided in romans and italics, with small caps in both postures, with a few unexpectedly sophisticated touches like tabular figures, fractions, and symbols. These styles feature both swash caps and swash small caps, making it possible to dial up the typography’s whimsy in subtle increments. 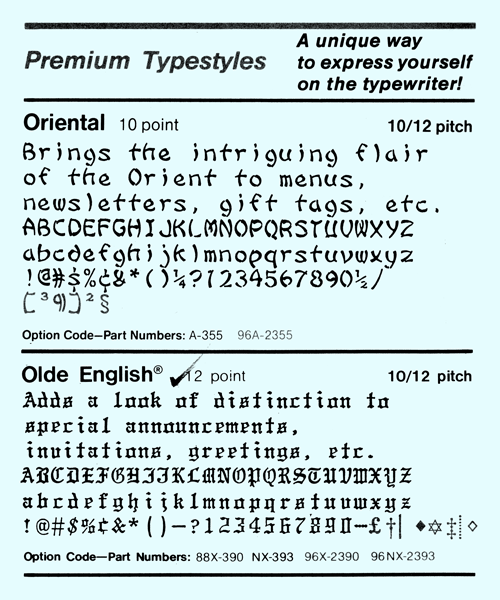 Inkwell Sans is the companion sans serif, provided in the same twelve parallel styles, again with small caps and numerics throughout. Its capitals are reminiscent of inscriptional lettering, taking nicely to letterspacing, and its lowercase is again designed to be unmannered in style. Where the sans roman was based on my handwriting (or rather, an idealized version of what I might be able to print with great care), the sans italic is the product of Jordan’s hand, and brings a touch of signpainting to the Inkwell family, especially in its heaviest weights. I’ve always had a deep fondness for gothic forms, and couldn’t resist making Inkwell Blackletter a part of the family. It’s tempting to write off the blackletter as an archaic style, but it’s very much alive today, and remains the easiest way to signal gravity in anything you do. It’s ceremonial for weddings and graduations, and adds a dash of tradition to the rustic and highbrow alike. Law journals and heavy metal bands both rely on blackletter typefaces for their gravitas, in admittedly different directions. Inkwell Blackletter is happy to serve both masters. Because written letters can often take a turn for the fancy, we’ve designed Inkwell Tuscan as the decorative member of the family. Tuscan faces are nineteenth century inventions that feature fishtailed serifs, an idea that we’ve implemented in an unusual way to ensure that even serif-free letters like O can be fully embellished. As it progresses from light to dark, Inkwell Tuscan takes on very different flavors, from sweet and bucolic to boisterously burlesque. The final style is Inkwell Open, a set of capitals inspired by the sorts of letters used by engineers. My father was a theatrical set designer, and I remember his titling his shop drawings in a style like this. I’ve since seen letters like these on blueprints, patent applications, and technical drawings, and even reduced to geometry on a lettering stencil. Open capitals are a useful way to identify something as a heading, or to indicate that something is otherwise elevated above the text. Inkwell by H&Co. From $129, exclusively at typography.com. 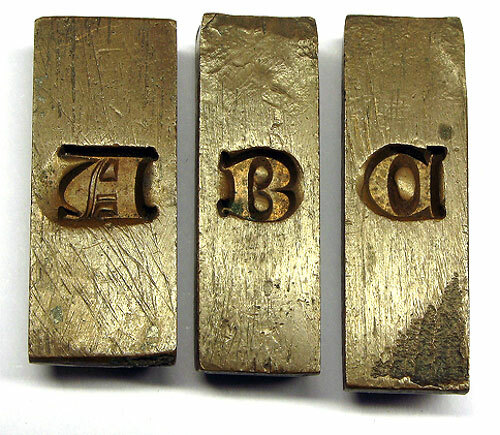 James Mosley shared with me this striking photograph of some of the world’s oldest type-making material. These brass matrices, made by a Dutch punchcutter in 1508, are now in the collection of the Enschedé Museum in Haarlem. It’s remarkable that they’ve survived long enough to celebrate their 500th birthday.  Especially enthusiastic type buffs might recognize these as the Great Primer Uncials that we adapted for our Historical Allsorts collection, but even the most devoted connoisseur is unlikely to know the name of the man behind them. It’s amazing that we don’t, given his significance: historian H. D. L. Vervliet identifies an entire historical period with the designer’s name alone, noting that as many as half of all books printed in Holland in the first half of the sixteenth century featured this one man’s typefaces. This was an extraordinary achievement for a man less famous than his contemporaries Garamond, Granjon or Plantin, so we have to ask — doing our best Graham Chapman impression — why is it that the world has forgotten the name of Henric Pieterszoon Lettersnijder? This elaborate pas de cinque requires five different materials, each chosen for a different metallurgical property. Steel’s tensile strength helps it hold small details and resist the blow of the hammer; the malleability of brass makes it a good candidate for receiving the steel; lead, cheap and abundant, has a low melting point; tin is more fluid than lead when molten (yet more durable than lead when it hardens); and antimony is highly crystalline, giving printing types more crisply defined edges. My reputation compels me to deny that I ever spent adolescent weekends hanging out at Tannen’s Magic Shop or The Compleat Strategist, and I certainly never wasted sunny afternoons playing with the Ohio Scientific computer downstairs at Polk’s Hobby Shop (even if it did have Lunar Lander in 16 colors.) But having burnished my nerd credentials through a career as a type designer, it seems safe to admit that, as a teen, I sported an enviable collection of golf balls for the family typewriter, a beloved IBM Selectric II. Yesterday, a conversation with my friend Tal induced a Proustian flash in which I recalled — and was actually able to find in the studio’s library — the above: entitled “GP Technologies Typing Element Handbook,” it’s a brochure from the early eighties that shows the complete range of styles available for the IBM Selectric typewriter. Sure, I had Courier, Orator, and both Prestige Pica and Prestige Elite, but it was more exotic numbers like these that I really went in for. A major coup was scoring Olde English, warts and all (let’s talk about that capital H some time), but my unattainable Philosopher’s Stone was Oriental, which no office supply shop in the five boroughs seemed to carry. What I would have done with the typeface is anyone’s guess (utility isn’t always relevant to the completist), but I can only imagine, given the font’s facile design and appalling intent, that it would have been something spectacularly ghastly.